NYPL: What's On The Menu? I think it is safe to say that my niche is turning out to be foodnerdery. Which is why I am ashamed that I missed the New York Public Library's initial announcement about the friggin' awesome What's On The Menu? project. What's on the Menu? 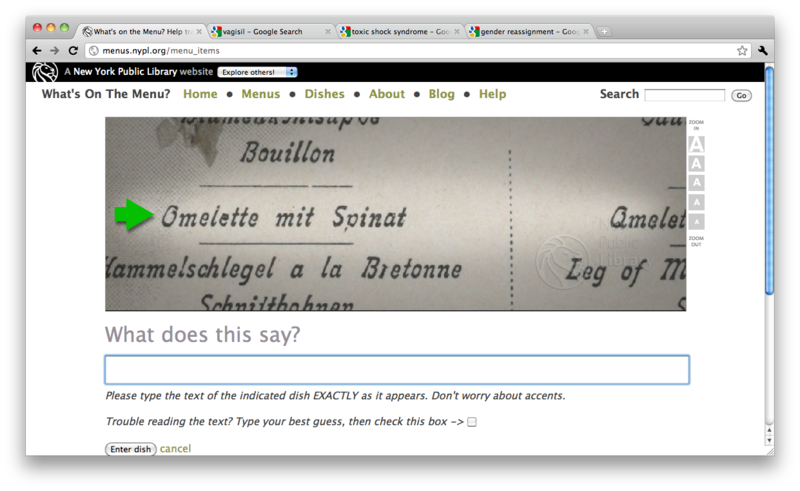 is a crowdsourcing project chartered to take their incredible menu collection and transcribe it. Before you think that no one would contribute to this, allow me to say that you are a cynical jerkward, aaaaannnnd... as of July 8th, 2011, there are over 430,000 menu items transcribed. 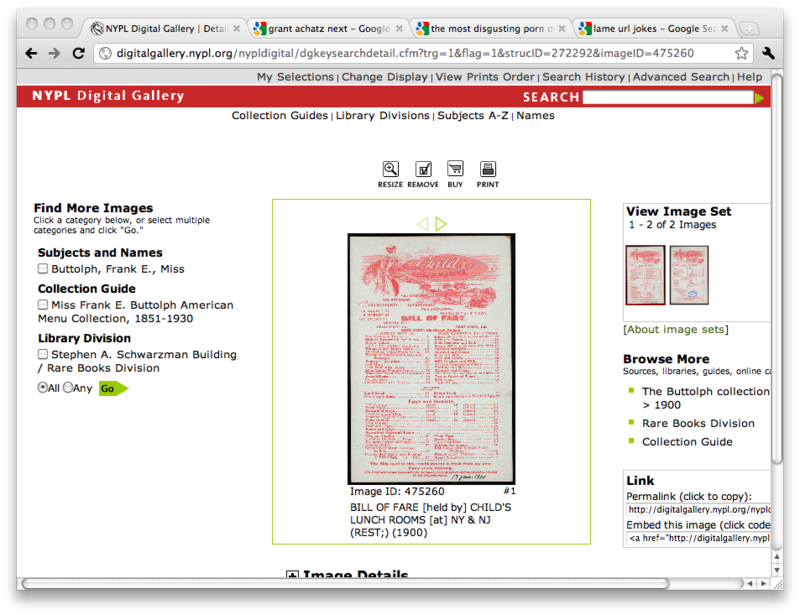 The NYPL menu collection has about 40,000 menus dating back to the turn of the century. Approximately 25% of the menu collection is available online, but only searchable by high level meta data about the restaurant, not the menu data itself. The first stage of the project is to take the menus that are already available digitally and have folks like you and me input what's on each menu. I started playing with it recently and the interface is pretty slick. Within a couple of seconds I found myself contributing to the effort by clicking on menus and transcribing dishes. It has enough smarts to provide the right kind of inputs for whatever menu or menu item you are transcribing. While I could go on and on about the tech side, what I think is really going to be awesome is how people will use the database. They plan on keeping it open and offer API and/or data export capability, so if you are a food historian trying to grok the rise and fall of various food trends, you'll only be a couple clicks away. Wait, you are a notable chef with a restaurant built around time and place themed menus? Pretty sure your New York, 1897 just got easier. My question to my readers are: If you had access to a crazy huge menu database that chronicles some portion of how we ate over the past 150 years, what would you use it for?